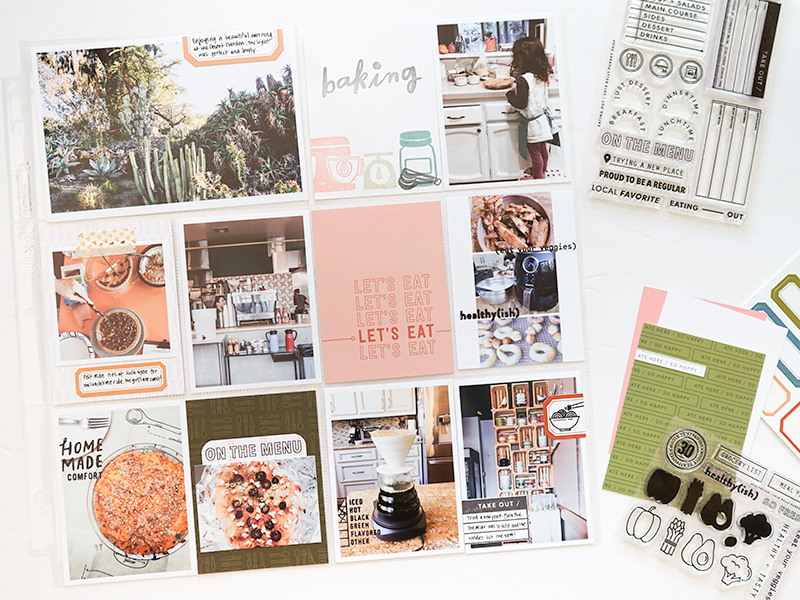 This month's kits and stamps have just been released at Kelly Purkey Shop and this release is all about FOOD - definitely one of my favorite things to document! You can view all of the new release products here. Since 3/14 was "Pi Day," I also had a couple of photos of the pies being given out and made that day. I again stamped some sentiments from the Homemade set. For a few months now, my daughter has been singing this song about funny food combinations that she learned from school and we've been joking about one of the combinations: popcorn pizza. She decided we should try it, and I figured, "why not?" so we did! I took a photo of the resulting pizza that she rolled out herself and put popcorn on. 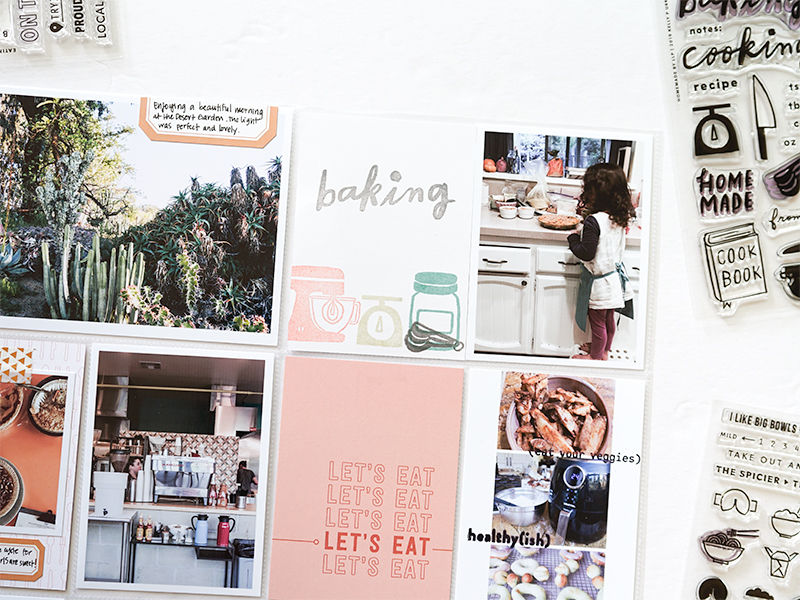 I made a pocket with the photo, and then cut a sheet to fit the pocket from the Food Journal TN kit, rounding the edges. 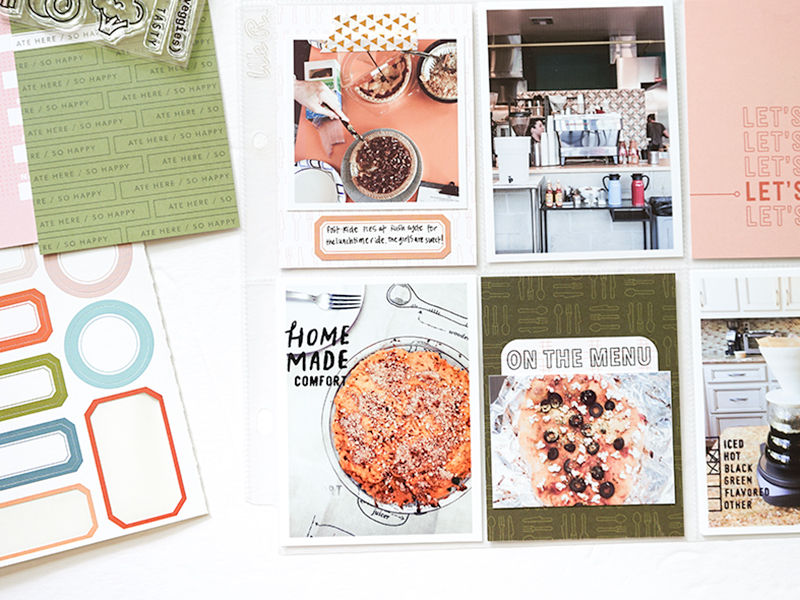 I stamped "on the menu" from the Eating Out kit stamp, and wrote the story on the card. I love including interactive elements when I can! I am lucky that my brother is a coffee connoisseur and happily makes me excellent cups of coffee whenever I come over. 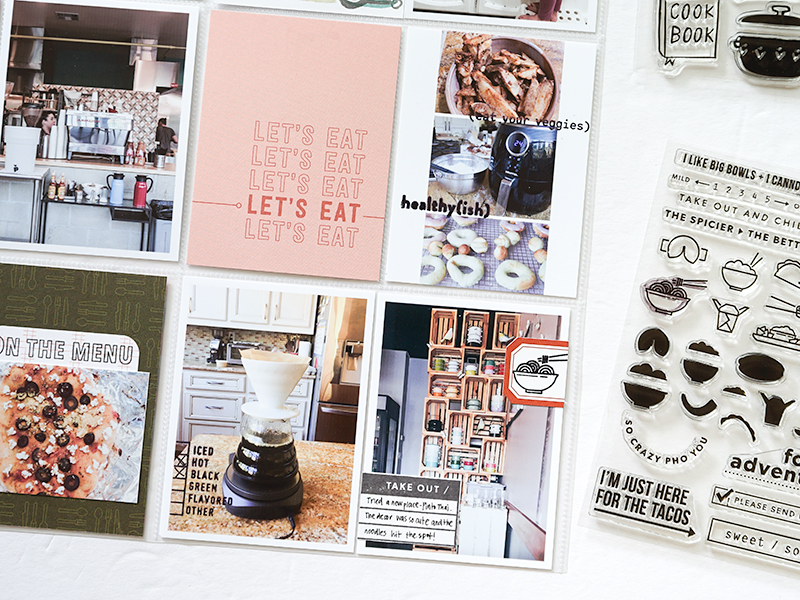 I used a photo of the coffee being made with the Cup of Comfort stamp from Life Love Paper. I have a lot of coffee stamps already, but this one has some unique designs, including stamps for tea-drinking! 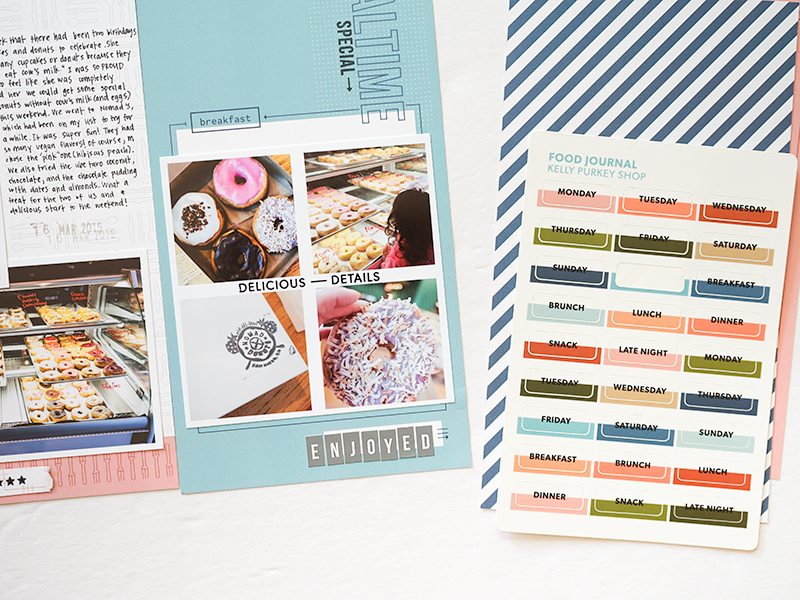 On the last photo, I used both the Eating Out kit stamp with the Food Adventure stamp to embellish a photo about trying some noodles at a new restaurant. 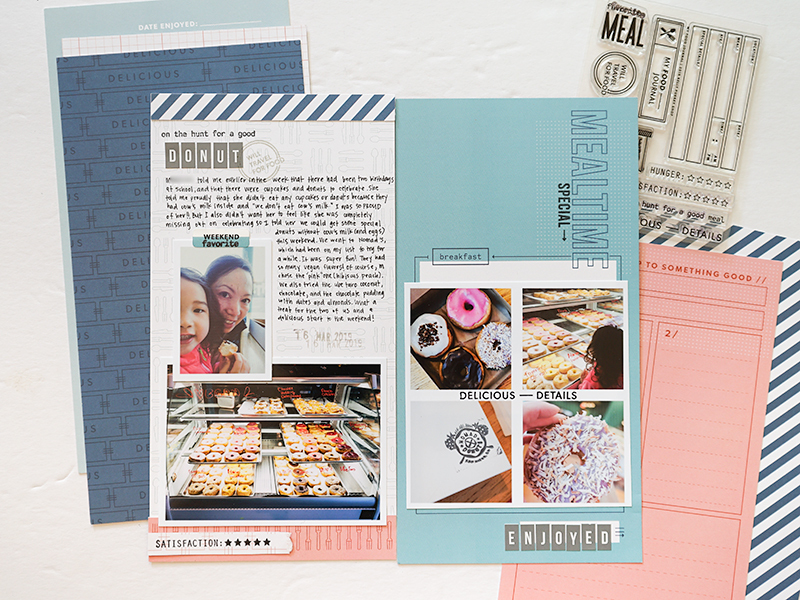 For my second project, I created this traveler's notebook layout about a visit to a donut shop with my daughter. 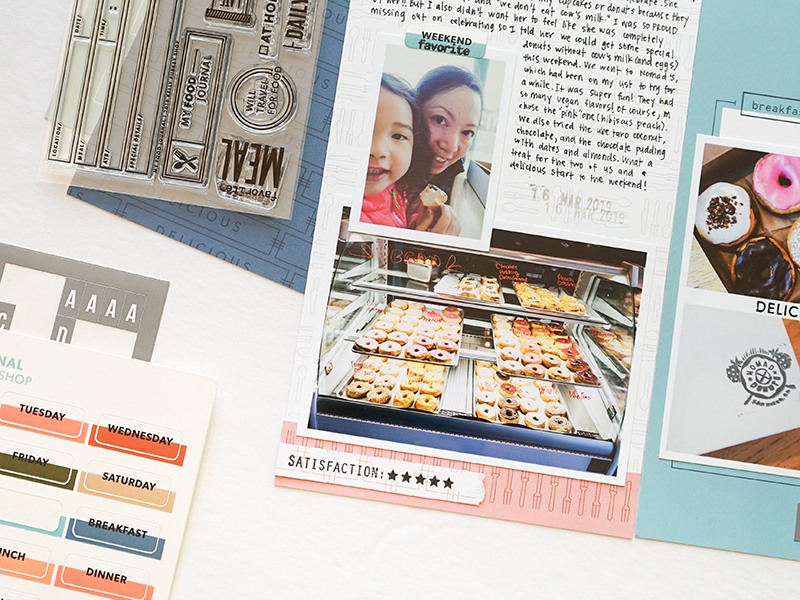 I used the Food Journal TN kit which worked nicely with the colorful donut colors! There were a lot of photos I wanted to feature, so I selected some, made a 4x4 collage of them in Photoshop, and adhered them on the blue "mealtime" page. 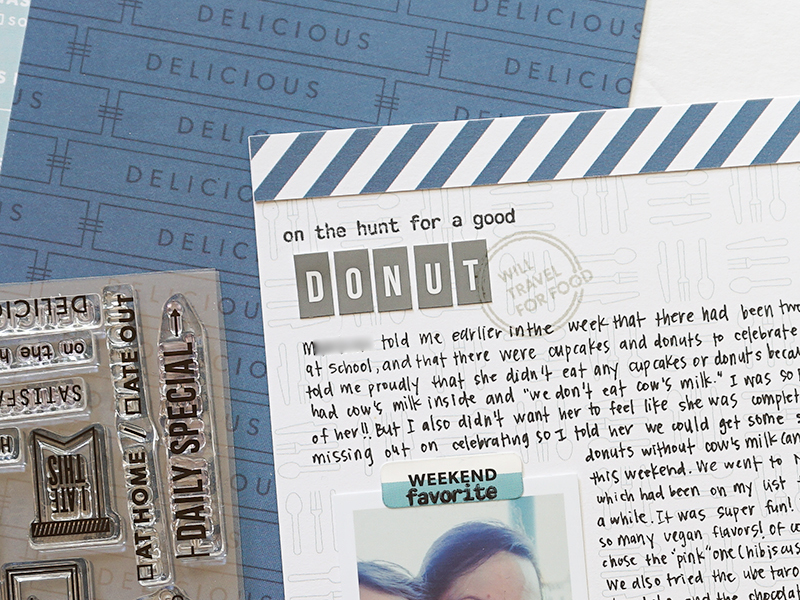 I stamped "Delicious Details" from the kit stamp and added some letter stickers to the bottom white rectangle. On the left page, I used the kit stamp with the letter stickers to make a title, adhered a couple more photos, and then wrote my journaling out. One of the pattern papers in the kit includes strips of patterns, so I cut one of these out to adhere on the bottom. I also stamped "satisfaction" to another pattern paper and cut this out to add to the bottom of the page. Lastly, I added one of the fun stickers included that spelled out "weekend" and stamped "favorite" underneath it. I love the way the different typefaces look together. Thanks for checking out my projects and I hope you like the release!